The Blackhawks got two first period goals while the Blues were 1 for 7 on the power play and Hawks goalie Antti Niemi made 34 saves as the Blues can’t rally past Chicago and lose 2-1. 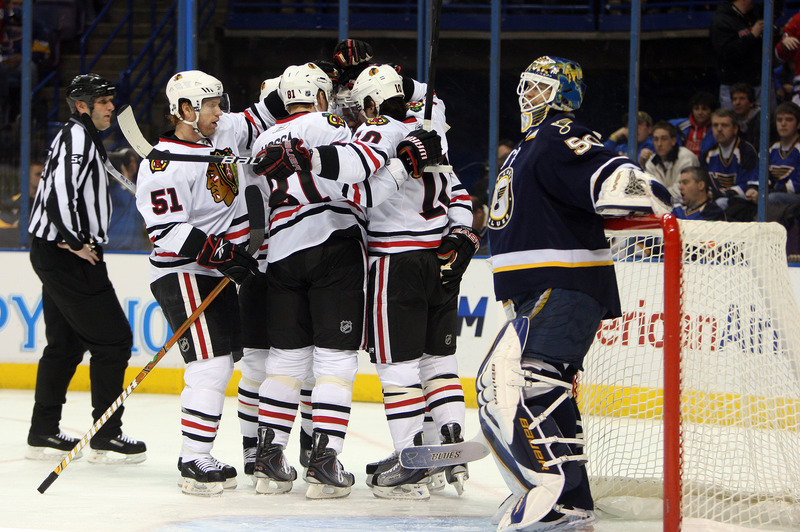 The Blues are now 9-16-5 on home ice as the Hawks are 10-1-2 in the second game on back to back games. 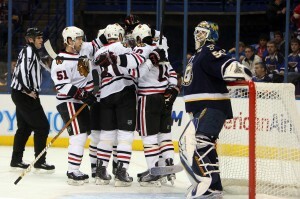 Patrick Sharp and Jonathan Toews scored early for the Hawks, but the Blues put constant pressure on Niemi all night. He gave up several rebounds, but made great saves as I liked the Blues effort all night. They suffered on the power play. In the second period they had a 4 on 3 and 5 on 3, but couldn’t covert. Late in the third period the Hawks got called for a hook, then an unsportsmanlike penalty and on their second 5 on 3 opportunity, they scored when Alex Steen blasted one from the deep slot through a crowd that Niemi low. With a 5 on 4, the Blues pulled Chris Mason who made 28 saves, but the Blues were unable to get any pressure on the Hawks in the final minute.